The photo which Guardian editors chose to illustrate a story by Harriet Sherwood on Israel’s decision to release millions of dollars in Palestinian tax revenue (Israel unfreezes Palestinian Authority tax millions, Nov. 30), two days after Sherwood’s piece on the effects of the tax freeze (Israel sanctions mean Palestinian Authority can not pay wages, Nov. 28), is so unrelated to the piece its amusing. It seems the Reuters stringer is quite adept at depicting Israeli soldiers targeting Palestinian innocence. Here an Israeli soldier is seen aiming his weapon, shot at angle which directs the eye at the “target” of a Palestinian girl holding balloons. Here, an IDF soldier frightens a Palestinian child. Search Google Images for a better view of Torokman’s Palestinian and Israeli caricatures. 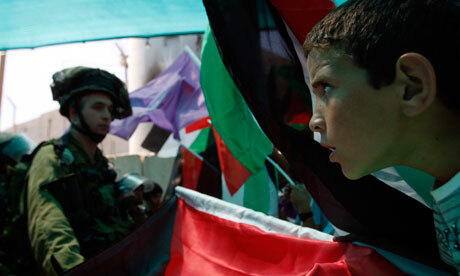 See future reports in the Guardian for more pro-Palestinian journalist activism. I agree occupation is a disgusting regime to be living under. I agree that socialism and islamofascism are disgusting ideologies to live under. You’re right; that’s why the Muslims should end their occupation of Judea, Samaria, and the Temple Mount, and stop agitating to take over even more land. You’re clutching at straws here, Adam. Basically the story shows Israel in a very bad light, withholding money which is not theirs and only releasing it after a barrage of criticism from even friends such as Tony Blair. The withholding of the Palestinian money does show the one-sided nature of the conflict and actually the image is a metaphore for the inequalityof power evident in the Israeli/Palestinian conflict. Here’s something to get really upset about, Adam: the treatment of Palestinian children by the IDF and the military courts. Stuart, what might be, for you, an equality of power? Before you answer, try to think about the wilful inculcation of hatred on PA TV, about the death and glory attitude and rampant Jew-hatred, and the ease with which Palestinians and their authority misrepresent all of them as victims, aided and abetted by their useful idiots all around the world. Do you believe that people always have choices? Why are these people encouraged by their people to love death more than life, when their leaders love their own lives and wouldn’t dream of risking them? * Try to imagine what might have happened if, instead of attacking Israel in 1947 and then bleating under Arafat that they are a people without a land, the Palestinian leadership made peace. Wouldn’t compromise be better for Palestinians? Why cannot they compromise, do you think? Why, if compromise can, in effect, mean that both sides win, does the Palestinian people not go for that? How do you think those who murdered the Vogel family in Itamar, as well as so cruelly disposed of other lives came to the pass they did? What encouraged them to do that? Do you think they had choices and if not, why not? Might their actions not have had a lot to do with the “encouragement” they got from whatever schooling they had and the manipulation of them by their leaders as well as the official media and television? A picture may speak a thousand words but it also, in the hands of the mainstream media like the Guardian, tells a thousand lies and distortions. And you hole yourself below the water line when you quote from btselem which is hardly disinterested. Stuart, Do you REALLY care about children? Or are you posturing? Here is a link to a video of an young Arab child who has been brainwashed by her teachers to believe, to recite that Jews are the sons of pigs and monkeys. How outraged would you be if non-Arab children were brainwashed that Arabs are the sons of pigs and monkeys. Do you and your teachers demand that Arabs end their racism??? Please Stuart, don’t have DOUBLE STANDARDS. I’m far more upset about the lethality of stone-throwers. As always the remedy is in Muslim Arab hands. Looking at the second photograph, why is the child in silhouette when the soldier is in full 3D colour? The child looks stylised (balloons and all!) almost cartoon like? Er guys – the second image, captioned “Here an Israeli soldier is seen aiming his weapon, shot at angle which directs the eye at the “target” of a Palestinian girl holding balloons.” The girl with the balloons is a drawing on the illegal barrier, as shown by the divide line across 1 balloon. So, sorry everyone – no need for conspiracy theories about photoshop, the “evil” Guardian and so on. ‘Scuse me, how are we meant to know that the soldier is indeed aiming at a child? You can hardly take the Guardian’s word for it given its reputation for distortions and half-truths if you are blessed even with a little intelligence. Prove that he was aiming at a child, other than in the Guardian’s and your own fevered and distorted imagination. If you can’t then be a grown up and admit it. Actually it was Adam who claimed that was what it looks like. Really? Here is fairly thorough study with actual examples of Photoshop Fauxtography in the aid of Islamofascism. You are joking, right? Clearly the girl with balloons is just a painting. It shows that ‘the child’ is a piece of political art by the artist Banksy. There’s a difference between standing up for your cause and just being a bloody idiot. You know, SarahLeah you are right – there IS a bad smell about that photo. Even if it were not a forgery (and I wouldn’t put it past the Guardian either to photoshop it or use one photoshopped by others without research or undue concern, the little girl doesn’t seem to be frightened at all, does she, otherwise she would be cowering. All of which begs the question as to what the soldier is pointing at. It’s more likely that he’s facing a stone-throwing rabble. All of these images show soldiers using the telescopic sights on their weapons to see what’s happening at a distance. It’s easy to find similar images of British troops in Belfast, or these days in Afghanistan. The fact that they’re looking through a telescopic sight doesn’t mean they’re aiming at anything and about to fire the weapon. For the record, the definition of lethal, adj – made to cause death: a lethal attack. In the first 10 years of this decade nearly 1000 minors (under 18) were killed in the West Bank and Gaza by the IDF. As far as I know no IDF soldiers were killed by stone throwing in the same period. Serendipity, we could discuss the injustice of 1947, but I agree with the concensus of countries that recognise the state of Israel. I also agree with the concensus that the settlements are illegal (in the UN General Assembly, 170 for, 6 against: Israel, the US that says they are illicit and 4 Pacific island states with a total population less than 20% of Tel Aviv). I agree with your condemnation of hate speech and acts whether it be from Hamas or the ultra-Orthodox settlers. Sad to say, it is you who is sinking beneath the waves with “And you hole yourself below the water line when you quote from btselem which is hardly disinterested.” Btshelem is rightly held with the highest respect by governments and inter-government organisations worldwide. But I do understand that the truth hurts. •In 2006-2009, the New Israel Fund (NIF) authorized grants worth $897,007 to B’Tselem (2006, 2007, 2008, 2009). •B’Tselem’s reports are repeated by international NGO superpowers such as Amnesty International and Human Rights Watch, as well as Palestinian NGOs. B’Tselem also presses its political agenda actively in the Israeli courts and the Knesset. •B’Tselem has faced serious criticism for its misrepresentations of international law, inaccurate research, and skewed statistics (including casualty lists). Relies on statistics and reports of other NGOs, despite the political agendas and credibility problems of these other groups. Ariadne, please – the article above is from Commentary that describes itself as “the flagship of neoconservatism” – ’nuff said. Stuart, perhaps you prefer Pravda? Well, the first three dot points are all in their favour for those concerned about helping to make the world a better place: NIF, EU, Christian Aid, AI etc etc. As we have no info about the source of these “serious criticisms” , they do not merit an answer. You should look at the volume of articles showing how bad B’Tselem is. There are 180 and I am sure there will be chapter and verse on all of their misdeeds. There is no point in making the world a better place if one is aiming for a world without Israel. Don’t forget that Communism was responsible for even more murders of innocents than Islam is. Stuart, please stop referring to B’Tselem’s findings as if they are holy writ! “… try to think about the wilful inculcation of hatred on PA TV, about the death and glory attitude and rampant Jew-hatred, and the ease with which Palestinians and their authority misrepresent all of them as victims, aided and abetted by their useful idiots all around the world. “Do you believe that people always have choices? “Why are these people encouraged by their people to love death more than life, when their leaders love their own lives and wouldn’t dream of risking them? * Try to imagine what might have happened if, instead of attacking Israel in 1947 and then bleating under Arafat that they are a people without a land, the Palestinian leadership made peace. “Wouldn’t compromise be better for Palestinians? Why cannot they compromise, do you think? Why, if compromise can, in effect, mean that both sides win, does the Palestinian people not go for that? “How do you think those who murdered the Vogel family in Itamar, as well as so cruelly disposed of other lives came to the pass they did? What encouraged them to do that? Do you think they had choices and if not, why not? Why do you think that Abbas glorifies suicide murder and allows school textbooks and children’s television programmes to convey that killing Jews should be the apotheosis of children’s existence? What purpose could that possibly serve other than transmit the hatred from generation to generation? Why do you think that the UN doesn’t protest against this abuse of children’s rights? Why don’t you? These are not difficult questions and call for original opinions from you. Can you step up to the plate? You’re on a loser Stuart when you have to start defining what is lethal. I suspect that many contributors here know full well the lethality of intent, if not actions, of the Palestinian mob, egged on by their leaders and supporters around the world. Which governments, other than Islamic and conflicted about Israel accepts what B’Tselem says without question? BTselem is hardly respected or respectable when the only quotes from its findings are used by Israel detractors and haters. What are you doing about openly condemning and acting against hate speech and the inculcation of hatred into little children? Words are cheap. Actions mean much much more. We could indeed discuss the injustice of 1947, but I suspect that we would mean different things by it. Myself, I believe, I think with considerable justification, that the greatest injustice was perpetrated against Palestinians by their own leaders who, not content with defeat in that first battle, risked the lot and failed subsequently again and again instead of coming to terms. That they twisted their own boneheaded obstinacy into feeling victimised and bamboozled the rest of the world into agreeing with them is hardly Israel’s fault, nor should Israel be blamed for defending herself subsequently against the fruits of that belligerent self-pity. What a pathetic mob . a) The girl with the balloons is (I think) a painting by Banksy. b) The photo is from Reuters. No photoshopping, and no Guardian involved. And you know this how? Are you friends with the photographer(s) or have you an “in” at the Guardian? And Reuters are no strangers to the devious and questionable art of fauxtography are they? Certainly not. How do I know this? I read the article and did a quick Google. Pardon me, a “quick Google” of what? And doesn’t it strike you as odd that a soldier behaving as “threateningly” as the soldier allegedly in the third photograph should be walked past so closely by Palestinian women and children? What would your instinct be? 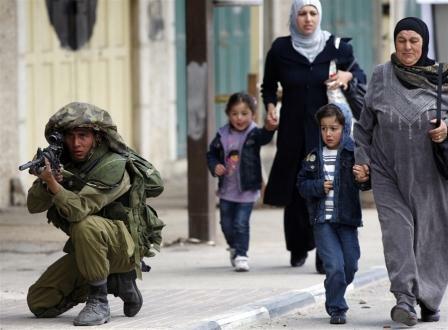 True, the child doesn’t look pleased but that might be because of other reasons, but if you were a Palestinian mother faced with a soldier in such a position would you not either take an alternative route, or give him a much wider berth if you cared about your children? No, this is a fake, or the Palestinian mother is compromised in some way in that she could put her child and herself in danger. I was talking specifically about the girl with balloons picture. Of that very photo. You can do that now with Google, in case you didn’t know. Allegedly? It was Adam himself who used the word “frightens”, if that’s what you mean. But as for the actual article: yes, the Guardian does indeed seem to have only a very select range of (negative) photos for articles about I/P. Not sure about your take on the “girl” holding balloons, mind. I have probably spent long enough boosting the pages viewed of CIF Watch. So, farewell – I may see some of you in the forums of another newspaper you consider to be guilty of antisemitism: Haaretz. And to make that clear: by “why” I mean “if”. Is that a vote for Photoshop? Not sure – but I do know that various posters managed to completely misinterpret both that photo and its description in the article. What do you think? It’s been photo shopped,even blind Freddie and his blind guide dog could see that those pictures were photo shopped……. That racist Guardian never ceases to amaze at the depths that they are willing to sink to smirch Israel……. It? What exactly has been photo shopped? No Israeli soldier would be crouching in that position with his back exposed to anyone who would want to attack him from behind. That second picture speaks for itself and the racist Guardian’s sick obsession with Israel………. A very amateurish and crude attempt at photo manipulation..
His back is probably covered by an ICB just in case one of the children ‘do’ something. The IOF are such brave soldiers scaring little kids seems to be one of their favourite past times. The IOF – Islamofascist Occupation Forces brainwash their own children into a religion of hate. That racist Guardian doesn’t use reasoning or logical thought,they create articles not based on hard facts, instead based on their own manipulated theories, they make up the facts as they go. There is a great difference between scaring palestinian children,and killing Jewish children in heir sleep,or smashing little Jewish babies skulls against rocks. Only the palestinian “frrreedom fighters” are capable of such brave acts against innocent and defenseless children, these kind of brave acts merits special mention and showering of gifts and money to these monsters from the palestinian rais Abbas…………..